If asked to point to a scene that truly defines the word “joy,” we’d be hard-pressed to find a better image than that of children at play on a playground. On the playground, the kid next to you can become your best friend, at least for the duration of your visit. The sound of laughter fills the air. Sometimes, however, there’s a different sound – a child crying. Playground injuries, and we’re talking about injuries that require more than a small bandage, ice pack, and Mom’s magical kiss, can be a serious matter. Terrible injuries and even deaths can stem from faulty equipment, negligent supervision, improperly constructed play areas, and other legally actionable wrongs. When such injuries strike a child in Northern California, our Oakland playground injury attorney is ready to help. The swing is one of the iconic pieces of playground equipment and companies have adapted swings for home use. One such swing is being removed from the market due to a fall hazard. ABC7 News reports that Ikea issued a recall for its Gungung swing. The swing was sold for $20 at Ikea stores across the U.S. and online. The swing, made for children ages 3 to 7, includes a green polyester fabric seat, suspension fittings and steel hooks and marketed for both indoor and outdoor use. IKEA issued the recall after four reports of the swing’s suspension fittings breaking during use. One child suffered a fractured leg in a fall from the swing. There have been no reports of such incidents in the United States. Per the U.S. Consumer Product Safety Commission, the recall includes approximately 2,000 swings in the United States plus 300 in Canada. Those who purchased the swing can return it for a full refund. While the IKEA swings were marketed for home use, swings are also a fixture on playgrounds. According to the Centers for Disease Control’s Fact Sheet on Playground Injuries, more than 200,000 children aged 14 and under are treated in emergency rooms in the United States each year for playground-related injuries. Most non-fatal injuries (70%) occur on public playgrounds including schools and daycares. Severe fractures, dislocations, amputations, internal injuries, and concussions account for 45% of playground injuries. Climbing equipment is responsible for the more injuries than any other equipment on public playgrounds while swings hold that dubious distinction for home playgrounds. Tragically, some playground injuries are deadly. 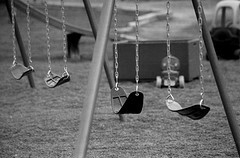 Between 1990 and 2000, 147 children under age 14 died due to playground injuries. The largest share, 56% or 82 children, died due to strangulation. Thirty-one children, 20% of the total, died due to falls. A majority of playground-equipment deaths (70%) happened on home playgrounds. When a child is injured, parents want answers. From a legal standpoint, liability can come in several forms. Products liability law holds manufacturers and sellers liable for faulty equipment. Premises liability principles may hold an owner or operator for dangerous conditions including hazardous playground construction choices. Negligent supervision may also apply. In some cases, it may be important to consider the issue of sovereign immunity and/or follow detailed processes for suits against government-related entities (i.e. public schools). Some might say talking about lawsuits for playground injuries is being overly litigious, making a simple childhood accident into an undue legal issue. However, we’ve found those who pursue litigation do so for incidents well beyond an every-day child’s stumble. In accordance with our ethical duties, we only bring suit when we believe a legal wrong was done. Our clients are fighting for children who were wrongfully injured and may be facing lifelong ailments that come with lifelong costs. These suits provide money for the injured or grieving. Furthermore, they protect all children by holding people/entities accountable and forcing changes that will prevent future harm. If your child was seriously hurt on a Northern California playground because a negligent or wrongful decision made the playground unduly dangerous, call our child injury law firm in San Francisco, Oakland, or Santa Rosa. We are here for you and for your child.